Normally, Steve Hyde doesn't watch "The Oprah Winfrey Show." The retired history teacher says his wife is usually the one who tunes in. 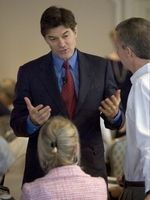 But he admits he's caught the popular talk show a few times when Dr. Mehmet Oz has been a guest. Each time, it's been the same thing. Oz, dressed in his blue surgical scrubs, seems to captivate the audience with his charismatic smile, down-to-earth personality and nearly encyclopedic knowledge of the human body. No matter the topic -- death, diet, disease or even erectile dysfunction -- Oz commands the stage. Even Oprah, who has dubbed him "America's doctor," appears to hang on Oz's every word. Hyde knows that look well. He used to see it on the faces of the Tower Hill football players he coached whenever they'd talk to Oz, a linebacker for the team. Oz was co-captain his senior year and part of the reason Tower Hill not only captured the conference championship in 1977 but defeated its archrival, Wilmington Friends, for the first time in a decade. Oz was a fiery motivator respected by his teammates, Hyde recalled. They nicknamed him "The Mad Turk," a well-meaning homage to his Turkish descent and his willingness to play as hard as he asked others to play. "It's just an aura about him. People gravitated to him," said Hyde, who taught at the private school in Wilmington for 33 years before retiring earlier this year. "...We sort of sensed early on that he was somewhat special." Nearly 30 years removed from the football field, Oz now tackles a far more imposing opponent -- America's increasingly unhealthy lifestyle and diet that are behind our growing waistlines and possibly shortened lifespans. Oz is a renowned heart surgeon and professor at New York-Presbyterian Hospital at Columbia University. He also is the co-author of several books, most recently "YOU: Staying Young," written with Dr. Michael Roizen of the Cleveland Clinic, which came out last week. When not writing best-sellers and columns for magazines like Esquire and Reader's Digest, he's appearing on "Oprah" or working on programs for Discovery Health, where he is senior medical correspondent. Oh, and he's a married father of four. Doing even half of what Oz accomplishes in a day would be too much for most people, but not for a self-professed "restless guy." It's the constant challenge and hunt for answers that keeps him motivated, he said during a recent phone interview, and it's why he requires a staff of people to keep up with his many appointments. "Medicine has been a good match for my personality," said Oz, 47, who claims he's not wired to be able to just sit on the couch and watch television. "I'll never master the field." Seval Oz Ozveren likes to joke she was her brother's first patient. When they were kids growing up in Wilmington, young Mehmet would insist on taking her blood pressure. He also would use the plastic syringes their father brought home from the hospital to stab unpeeled oranges and extract the juice as if he were drawing blood. Then he would attempt to inject the juice into her head. "He was trying to find a pore, like what was in the orange. Of course, it would wind up all over the place," said Ozveren, who now lives in California. "We were both curious kids. My mom had a sense of: Let them figure it out. We were never reprimanded for that." Following the path of his father, Dr. Mustafa Oz, Mehmet opted for medical school. Medicine, after all, was what brought the family to Delaware. Mustafa, now retired and living with his wife, Suna, in their native Turkey, served for years as chief of thoracic surgery at the Medical Center of Delaware, now part of the Christiana Care Health System. Growing up, Ozveren said, she and her siblings saw how dedicated their father was to his patients. On the weekends, family trips to the mall or out of town frequently were delayed for hours, or sometimes canceled, by Mustafa Oz's detour to the hospital for what he promised would be a short visit to check on a patient. "I don't ever recall my father stopping to see his patients quickly," she recalled. "He had a sense of caring for his patients. We were brought up with that sense of responsibility and decency -- making sure that the patient is cared for and not left alone, that he heals properly." It was through his father that Oz met his wife, Lisa. Oz was in medical school at the University of Pennsylvania when the elder Oz asked another surgeon, cardiologist Gerald Lemole, to join him on a medical trip to Turkey. When they returned, the two men celebrated their success overseas by bringing their families together for dinner at a Philadelphia restaurant. Though neither father knew, Oz and Lisa began secretly dating soon after that celebratory dinner. Eventually, the truth came out, and Oz approached Lemole. "He said, 'I love your daughter and I want to marry her,' " recalled Lemole, who now is director of Christiana Care's Center for Integrative Health. "I appreciated his forthrightness. He knew the proper way to do things." The joining of the two families gave Oz the opportunity to learn more about the world of nutrition, herbal remedies and other alternative therapies that have become an integral part of his medical approach. While he learned surgery in medical school, his mother-in-law, Jane Lemole, showed him less-invasive ways to care for patients through the use of supplements and herbs. Today, Oz said, every patient who sees him has the opportunity to get a free massage. His office also keeps a list of Reiki practitioners and pastoral service providers for interested patients, as Reiki and prayer have been credited with relieving stress, anxiety and pain. With some studies suggesting that up to three-quarters of all patients seek out alternative therapies but only about 17 percent tell their doctor, Oz hopes he can help patients integrate the best of Western and holistic medicine. He knows some doctors are skeptical of nontraditional therapies because they haven't been proved effective through clinical trials. But those same doctors will use medicines and devices off-label to treat health problems they haven't been approved for, he said. "As physicians, we went into medicine because we believe in science," he said. "But patients don't think about science or Western medicine or Eastern medicine. They'll say, 'I don't care if it's Jujubees if it makes me feel better.' "
Oz wants to do more than just fix people whose bodies are broken. He wants to empower patients to get involved in their own health, to think more about the foods they put in their bodies, to explore ways of caring for themselves other than taking doctor-prescribed pills for the rest of their lives. He believes patients should challenge their doctors, ask questions and not accept every medical opinion as gospel. To be fair, patients also should follow their doctors' recommendations and be honest about what's going on in their lives. "There needs to be a tug-of-war," Oz said. "I tell patients this is like a pro-am tournament. If you don't play, we don't win. And in this case, it's your health." Oz also practices what he preaches. He eats organic produce, avoids processed foods and always makes time for exercise. During a recent visit to the Lemole house, Oz played a round of golf, took on his wife and youngest daughter in a game of tennis, then followed that up with a seven-mile run. Judging by the overwhelmingly positive response to his books and TV appearances, Oz seems to have hit a critical nerve with Americans, said Daniel Monti, executive and medical director of the Jefferson-Myrna Brind Center for Integrative Health at Thomas Jefferson University and Hospital in Philadelphia. More people want to know what they can do to improve their health so it's not solely in the hands of their doctors. Oz, along with other health professionals promoting a lifetime approach to diet, exercise, sleep and avoiding potential toxins, gives them that vehicle. "He has a message that's congruous to people today," said Monti, whose center blends Western medicine with complementary therapies. "This model reflects a change from a paternalistic relationship to a partnership between the doctor and patient." Like other integrative health experts who came before him, including Andrew Weil, Deepak Chopra and Dean Ornish, Oz has the potential not only to change people's lives but to improve the way doctors practice medicine, Monti said. But Lemole thinks the spark in Oz's personality gives him an edge the others just don't have. Oz connects with people in a way other doctors-turned-celebrities haven't, Lemole said. He can stand in front of an audience of strangers on "Oprah" and talk about the specifics of poop just as easily as he can mingle with fellow physicians at a medical event. "A lot of guys can't do it. A lot of us physicians haven't had enough experiences living with the average person to do that," Lemole said. "Our role [as physicians] becomes our being. We'd be better off with a couple of courses in interpersonal relationships in medical school." Ozveren believes her brother's years at Tower Hill equipped him well. From sports he learned the benefits of teamwork; in the classroom, it was how to aim high. "They gave us an awareness that we were competing to create a better world," she said. Oz still keeps in touch with former teachers and classmates from Tower Hill, including Hyde, who said that for all the success and fame his former student has received, he's still the same overachiever. He's not surprised Oz needs a team of people to make sure he stays on top of his demands and obligations. Even as a three-sport, straight-A student, Oz was a busy kid. When Hyde once asked him and a couple of other students why they didn't read more for pleasure, Oz said it was because he had such little free time. By the time he would return to a book he was reading he had forgotten what happened. "Time is something you have to make the most of," Hyde said. "I think it comes naturally to him." Writer Ted Spiker, who has worked with Oz and Roizen on their three books, including the most recent one, said Oz has a special blend of talents that allow him to keep up with his hectic lifestyle and still retain his enthusiasm for helping people lead healthier lives. "You know how some people are right brain and some are left brain? He's both," said Spiker, a former editor of Delaware Today magazine and an associate professor of journalism at the University of Florida. "He has the precision to be a heart surgeon and the creativity to be an artist. He can be in the operating room all during the week, then be working on these books on the weekends. Everybody wants a piece of him." Oz, who says he sleeps seven hours a night and feels relaxed despite his busy life, said he can't imagine being any other way. It makes sense then that the young boy who got notes from his teachers saying he had "ants in his pants" is now an acclaimed doctor who juggles patients, television appearances and book writing responsibilities while maintaining his focus on helping others help themselves. "When you see their irises dilate -- like they're getting an epiphany -- as they're moving from just knowledge to actually understanding what you're saying, bells start going off for me. I get goose bumps," said Oz. "You feel almost like a minister delivering a sermon. You hook 'em." Contact Kelly Bothum at 324-2962 or kbothum@delawareonline.com.